With IdSurvey you can export all the data collected in different formats from the “Export Results” page you can reach by clicking on the “Tools” icon on the survey menu. In this article we will focus on TXT format. Txt format (with fixed size columns) can be used in several data analysis software. The system will export by default all the results of all the interviews collected for that survey. By clicking on “Filter by Date” in the “Setting” box on the left, you can filter data to export according to a specific time frame, selecting days using the “From” – “To” fields. Only the interviews included in the time frame selected will be exported. 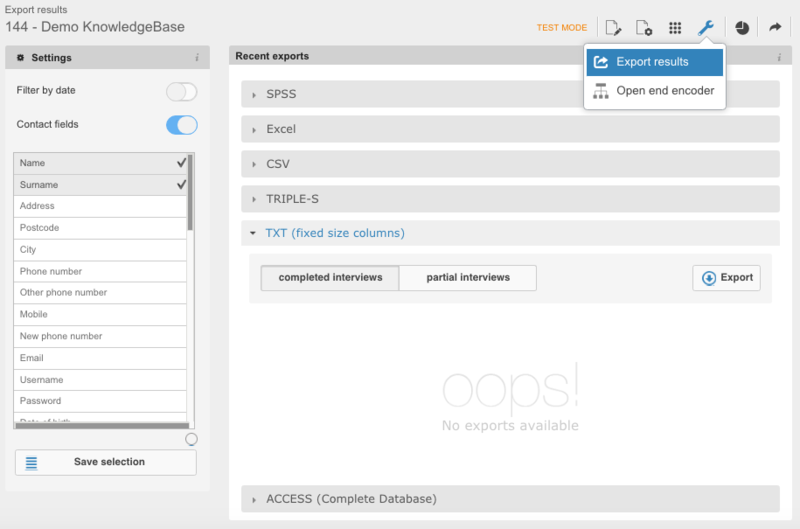 You can set filters only for exportation in SPSS, CSV, TXT format. The exportations in ACCESS format always includes all data collected. By clicking on “Contact fields”, you will choose which contact fields (among those uploaded in the contact database) you will export in the data file. These fields will be the first column of the exported file. To quickly select or deselect all contact fields, just click on the round button on the bottom right under the list. To save the chosen columns for future exports click on “Save export field” and the system will automatically register the action. In the TXT box select the type of interviews to export (complete or incomplete). Click on “Export” and wait for the exportation to be concluded then click on “Close”. In the “Export history” you will see the list of all the exports that were done. Exportations will be deleted after 3 days from creation.